"How to create a blog on blogger/Blogspot - Step by Step." Here you will learn about the blog on blogger and its establishment. I hope, you have already heard about the blog, blogger and the Blogspot. This topic is based on the creation of a blog on Blogger or you can say Blogspot. 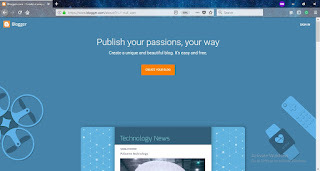 Blogger is a free service that is served by Google. You can create a blog on Blogger. You can choose here your desired name for blogs, its web address and you can create your blog that is just like as a website. There is so many better features are available their on blogger that made blogger is a most preferable platform than another platform. You don't need to pay to get a desired domain name. You don't need to pay anything to get web hosting and to get website making tools. All these features are including in blogger, even without any cost. You can also generate a good money here without investing a single coin here but you have to work hard for it. Even I am earning money from a blog. Extent of money depends upon several factors like your ad network, traffic, CPC, and CTR etc. Well, you will learn many things here about blogging, but first of all you should know the first step of the creation of a blog on a blogger/Blogspot. First of all, start from the platform of the blogger. Sign In to Blogger using your email ID and the password (Google Email ID). Then On the left, click on the Down arrow. Enter the name which you want for your blog. Click on the Create blog. Congratulations!!! Your blogger will create. "What is Blogging - Make Money from a Blog"